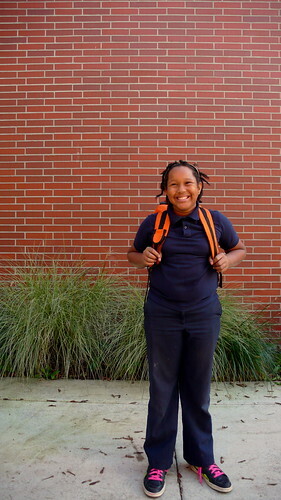 This month, we’re excited to feature a Bike Club participant from Rosa Parks Elementary School. 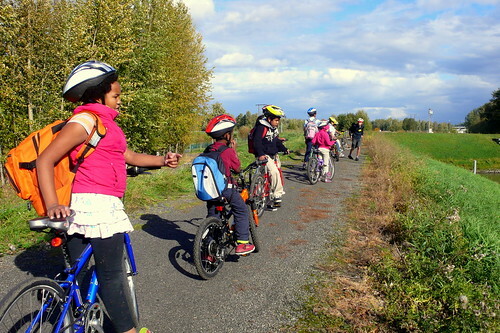 Rosa Parks is a new partnership for the Community Cycling Center, and we could not be more excited to work with them. The school is located directly across the street from New Columbia’s Bike Repair Hub and Skills Park, allowing for a collaboration between Bike Club and We All Can Ride bike committee members. Our Bike Club instructors, Theo and Andrea, sat down with 5th grader, Ayzha, to find out more about what she does outside of Bike Club. Ayzha’s mother earned her bicycle in our Create a Commuter program this year and now the whole family can ride together. Does anyone else in your family ride bikes? We all have bikes and sometimes ride as a family. My mom rides for work – she gets paid to ride bikes. Parks and places where I can get wet at, stores, and family members’ houses. What’s your favorite thing about Bike Club? When we get to ride places. I heard you cook with your family a lot. What’s your favorite thing to make? Not a lot, sometimes. Spaghetti [with] meatballs and sauce. I would have guessed orange, since your backpack and jacket are orange. [Laughs.] That’s my second favorite color. If you could have a superpower, what would you choose? And what would you do with it? Flying! Help anything in traffic. Like if a car was fitting to get hit by a train, I’d pick up the car and move them. And if not that, helping people who need to move things. Sounds like you’d need to have super strength, too, since cars are heavy. Yeah. And being smart. Strong, flying, and smart. I like being on the computer making and listening to music. I make songs on the app on my phone and that translates to the app on my computer. I like playing science and health learning games, but not other games.